When we talk about “exiting” a binary options online trade, it is not quite the same thing as talking about exiting another type of trade, like a normal stock trade or Forex trade. Those types of trades do not involve expiry times. The expiry time of a binary options online trade is one of its key identifying features. Anytime you buy a binary options online contract, it will come with a set expiry time when the trade will expire either in or out of the money. If the market does what you wagered it will do and you are in the money when the contract expires, you win. If the market goes against you and you are out of the money when the contract expires, you lose. Some binary options online brokers do not give you any control over the expiry time. You simply have the decision to make of whether to enter a trade in the first place, given its expiry time and other details. If the expiry time on the contract makes sense to you, then you would enter the trade. If it does not, you would avoid the trade. So say for example you are watching fifteen-minute price bars for a particular asset on your charting software, and you see a setup. You have every reason to believe that the trade will go your way within the next half hour, but you have no way to predict where the market will be in two hours, or in 5 minutes. If your broker offered a contract that would expire in 25 minutes, it would probably make sense to trade it. If the only contracts offered expired in 5 minutes or in three hours though, you would not want to enter the trade. It would be too unpredictable. If you do have the opportunity to set your expiration time to learn how to choose one that’s best for you. Options Builder: This is a customizable contract-building tool that allows you to input an expiry time of your choice. Rollover: This tool lets you stay in a trade which is going well for the chance to win further profit. Early closure: This is a tool which allows you to exit an existing trade early—either to cut your losses in a bad trade or to take profit in a good trade before it turns against you. How Do You Decide to Exit a Trade? Before you even enter into a binary options online trade, you should have a strategy in place for exiting. This is even more important with binary options online than other types of trading since you need to select an expiry time when you first purchase a contract. Think of it as setting a default close order on your trade. You also should have rules for rolling over and closing out early. There are several different ways that you can do this. On occasion you will find a broker that will actually let you set a stop loss and take profit point separately, but usually these functions are combined into the “early closure” tool. Many traders simply have a target in mind as well as a point at which they will incur no further losses. Trading without a mental stop loss (at the very least) is actually just asking to lose your entire trading account. Where you set your stop loss (get out of a losing trade) determines your risk. Your risk, according to your money management scheme, should determine the amount of your investment. If you violate your stop loss rules, you break your money management rules, and you definitely do not want to do that. That is just one example. Your own stop loss and take profit rules will be determined by your trading method. Also note that the method above is fairly unsophisticated. More on that in just a bit. This concept is a little tricky to translate into binary options online terms, but it has to do with the rollover function. Let us say that you are in a winning trade, and you believe that you are entering into the start of a new market trend. The market should go up and up and up for a long time according to the indicators on your chart. Once you reach your “take profit” level, should you exit your trade by default—or should you stay in and reap as much profit as possible? In many ways this is a personality thing. Some traders hate trailing stops and pursuing more profit, simply because it adds complexity to their lives (and there is the risk of breaking even and losing the profit you do have). Others will do it every time, because they figure the riskiest part is over (and it is), so why not ride out those profits and take as much as they can? If you do decide to do this, you can use the “rollover” tool in your platform to stay in after the contract expires. You also can theoretically use this tool to stay in a contract you are not yet winning to give yourself a chance at doing so—but this is often a “cut your losses” situation. If you are winning a trade and rollover, you should “trail” your stop loss. In other words, as price continues to move in the direction of profits, your stop should follow it. Consider moving your stop loss (the point at which you would close early) to breakeven or partial profit. Then see how high you can get your winnings by rolling over and enjoying the benefits of a risk free trade! Always check with your broker before trading to make sure you understand all limitations on these trading tools before you get started. You do not have to do this, but one recommendation is to make your stops mean something, instead of just mechanically placing them. For example, try placing stops underneath relevant support or resistance levels, or under or over candle lows or highs. Since these areas provide support or resistance for a trade you are in, your stop is less likely to be falsely triggered than if you ignore these areas. If price retraces off of these areas and then continues on its way, you will still be in your trade. It does not mean you will not still get stopped out of trades you should be in from time to time, but it is less likely than if you are just following some mechanical rule as I talked about before. When you exit a trade is every bit as important as when you enter one. It is one of the more challenging aspects of binary options online trading in particular, owing to the way that expiry times are set up. One thing you can do for yourself right from the outset is choose a broker that is going to give you the tools you need to control your trades and become successful. 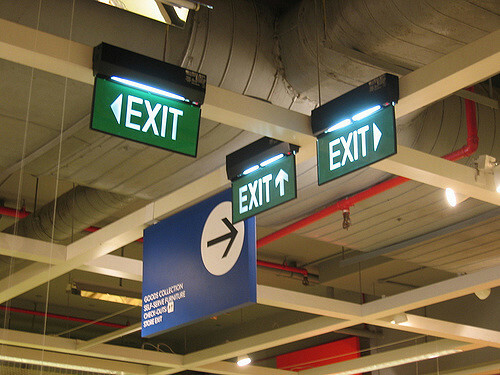 Then, you will need a set of exit rules which are as strong and reliable as your entry rules. Test them out before you use them live with real money, and good luck!